Updated: 11/9/2018 - Added new information on habitats. Paradox Interactive revealed today in a dev diary that they are working on update 2.2 which will overhaul the economy and trade mechanics. The focus of the dev diary is on resources. First off, they couldn't say if update 2.2 accompanies a new expansion. Which I'm guessing it is, and to add to that, I'm guessing the new unannounced expansion would be focusing on the economy and trade. The game's current economy has resources that were scripted and hard-coded. Which meant a lot of things couldn't be modded and changed. For instance, ships would cost minerals to produce (the number of minerals ships cost could be tweaked but not the resource type itself). He also announced that they've added new advanced resources for 2.2. Strategic resources such as Dark matter and Living Metal will still be in the game but how many of these will still be in the game and how they are used is still being worked on by the team. The top bar will be reworked to show consolidated resources and resources that are important to your empire. With this resource overhaul, they are completely redoing the top UI bar in the game to be able to display more resources. There will be some consolidation, for instance, the three science resources will now be shown as one, with tooltips used to break it down into the three resources. The Top bar will also show you resources that are important to your empire, so for Machine Empires, food won't be shown. And to top it off, you'll be able to manually override this and set for yourself, which resources you want to track on the top bar UI. 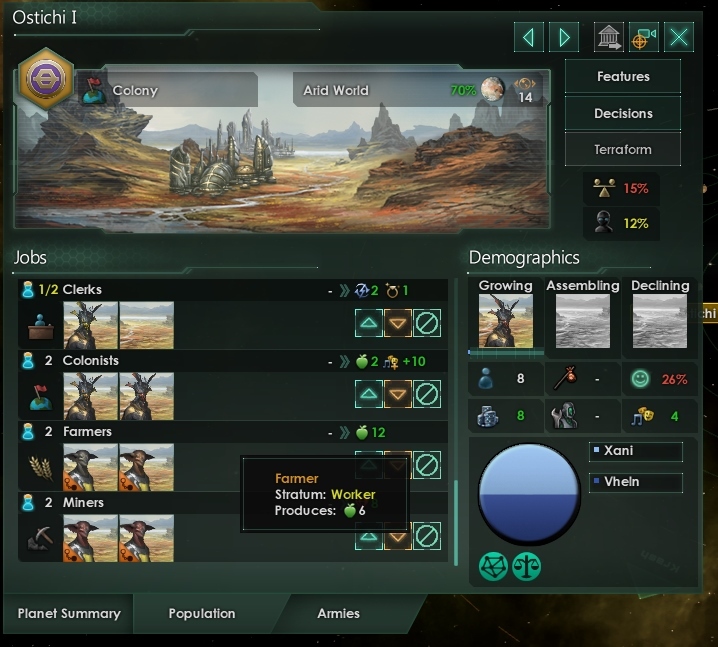 So with these changes, the Stellaris development team can make different factions that are more unique in terms of how they utilise resources. They will use different amounts of resources and even different resources for different functionalities. In a new dev diary, game director, Martin Anward shared the changes update 2.2 will bring to planetary management. This is possibly more massive than the changes to the economy. Thee objectives of completely changing the tile-based planet system was to allow more variety in terms of the type of society you want the planet to have, to reduce micro-management with mass upgrading buildings, to make planets feel more like places where your population lives rather than just resource gathering hubs. As you build more districts, you increase the infrastructure level of that planet. With more infrastructure, you unlock more building slots. Buildings are not limited to one tile and one pop any longer. Some buildings are limited to 1 per planet, and some can be built as much as you have building slots for it. What's interesting is that buildings can now give jobs to more than one pop. Buildings can still be upgraded but they will reduce the number of times they can be upgraded to reduce the micro-management. Deposits are no longer resources that are on tiles that are extracted by your pop. They are more like planetary terrain or feature. These deposits can increase the number of a particular district that can be built (eg. fertile lands increase the number of agricultural districts that can be built). Other deposits allow the construction of special buildings and some will give a planet-wide passive bonus. By ditching the tile-based system, issues such as over-population and under-population can be explored (since there is no hard-cap to population). Unemployment also becomes a much more realistic issue. 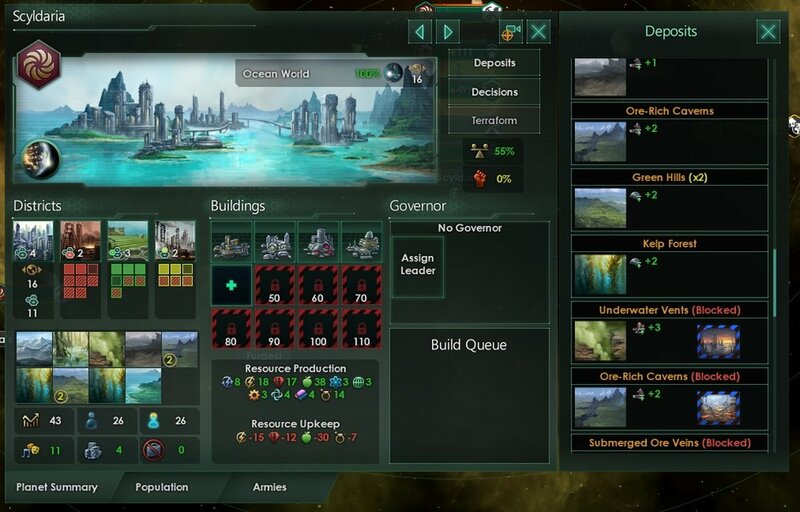 2.2 will introduce housing, which will dictate how big a population your planet can support (housing depends on the number of districts you have). There are two types of jobs for your citizens, capped and uncapped. Capped jobs are jobs that relate to resource the planet has, such as the number of mining jobs generated by mining districts. Uncapped jobs depend on the traits of your species such as producing food from livestock (this will be explained in a future dev diary). One of the big things is reducing the micro-management in assigning jobs to pops. In 2.2, jobs will automatically be filled with pops that fulfil the requirement to work in that job. Rulers: This stratum represents the government and wealthy elite. Ruler Pops have a much greater impact on Stability (more on this in next dev diary) than the other two classes and require a great deal of Luxury Goods to stay happy. Specialists: This stratum represents the educated population working in more prestigious and highly paid jobs. Specialist Pops typically work with refining resources or performing intellectual tasks, and require more Luxury Goods than workers in order to stay happy. Workers: This stratum represents the vast majority of the working population. They generally work with raw resource production and require fewer Luxury Goods than Rulers and Specialists. The most important factor in determining the productivity and prosperity of your planets. It represents the overall political stability on a planet and is influenced by a number of factors such as Pop Happiness, Housing, Amenities, Crime and more. The Pop Approval Rating is the average happiness of pops modified by their Political power. Political Power depends on their stratum and living conditions. So if you have a bunch of angry slaves, you can balance it out with a large number of rulers. Martin stated in the dev diary that update 2.2 is still 'far away', so it won't be going live any time soon. I'd expect the announcement of a new expansion in the next couple of months. The Stellaris dev team has been on an overhaul patch for the past 1 year, completely reworking some of its core mechanics. And most of the mechanics changes are included as updated to the game which means you don't have to buy an expansion to get it. I appreciate the team's dedication to evolving the game to be much deeper and better overall. And it has improved my gameplay experience by a mile. I'll update the blog once we have more info on update 2.2.